If there is one thing I've been doing this fall a lot more than previous years is wear more colour. Despite rocking all-black ensembles for work pretty much every day of the work week, when playtime comes around I want to inject some much-needed colour into my outfits. Which is why I am LOVING the fact that black and grey knits are things of the past and instead, gorgeous yellow and red tones are very much in fashion this fall. Love, love, love! 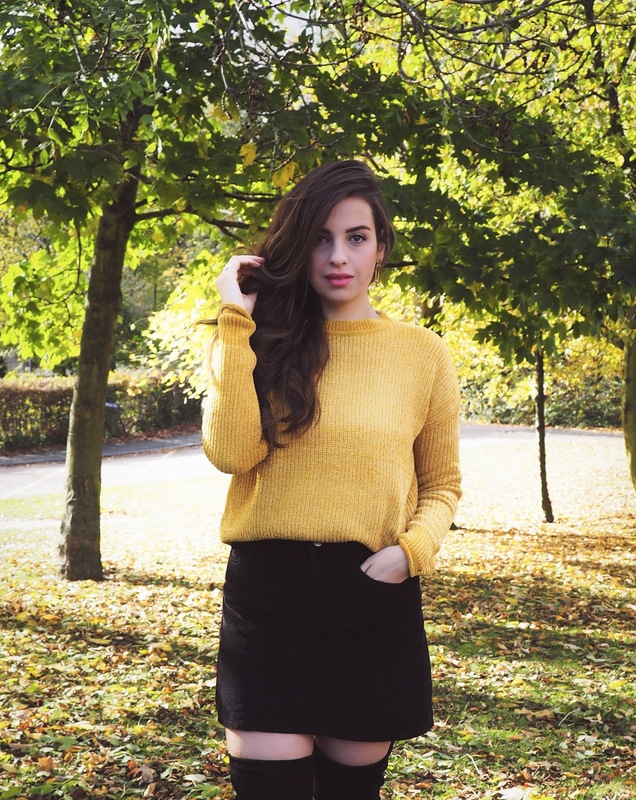 Needless to say, I've gone a little crazy in the knit department and added a few coloured ones to my wardrobe recently, like this gorgeous chenille jumper from good ol' Primark in this vibrant and eye-catching yellowy mustard colour. If I remember correctly it cost me little over £10 and it is the cosiest jumper I own. Even my mother, who isn't a fan of Primark, loved this jumper and said it looked really good quality for its price tag, which is exactly what you want to hear especially from bargain buys. I am tempted to go back and see if they do this in different colours, so let me know below if you have any! This jumper, apart from being in a super trendy colour, is also in the very popular fabric of the moment, chenille. Between the return of velvet, faux fur, and cable knits, comfort is what everyone wants this fall. One fabric, in particular, has had a huge comeback and that's chenille, something we had not seen since the 90s! Chenille is incredibly soft, comfy and snugly; it is the perfect jumper type all round and it almost makes you forget how miserable the weather outside is (I did say almost!). Most high street shops stock something in this fabric, like scarfs, jumpers and even hats and gloves, and I am obsessed because it simply looks good and feels good! Corduroy is a textile with a distinct pattern, a "cord" or wale. In essence, it is a ridged form of velvet and given retro 70s style is back this season, the corduroy trend is also stronger than ever. This mini skirt I am styling is from Urban Outfiters and I love the way it fits and feels. I have a few other corduroy pieces in my wardrobe such as pinafores, trousers and a jacket; personally, I love the fabric in subtle black and burgundy designs. This fabric instantly makes any outfit autumn/winter appropriate and I love how retro yet versatile it is. These are from Zaful believe it or not and I love how they look on. Granted, they're not the most comfortable pair of boots I own, but they stay up, which is always a mission with these type of boots. They seemed like the perfect footwear choice to go with the mini skirt, showing just enough skin to balance the look. When winter hits, I will be sure to wear tights underneath though. Something a little boxier on top in a similar outfit is also ideal like this knit jumper, to balance and to keep the outfit cool and winter-ready. Thoughts on this outfit? Let me know if you're a fan of any of these trends below! 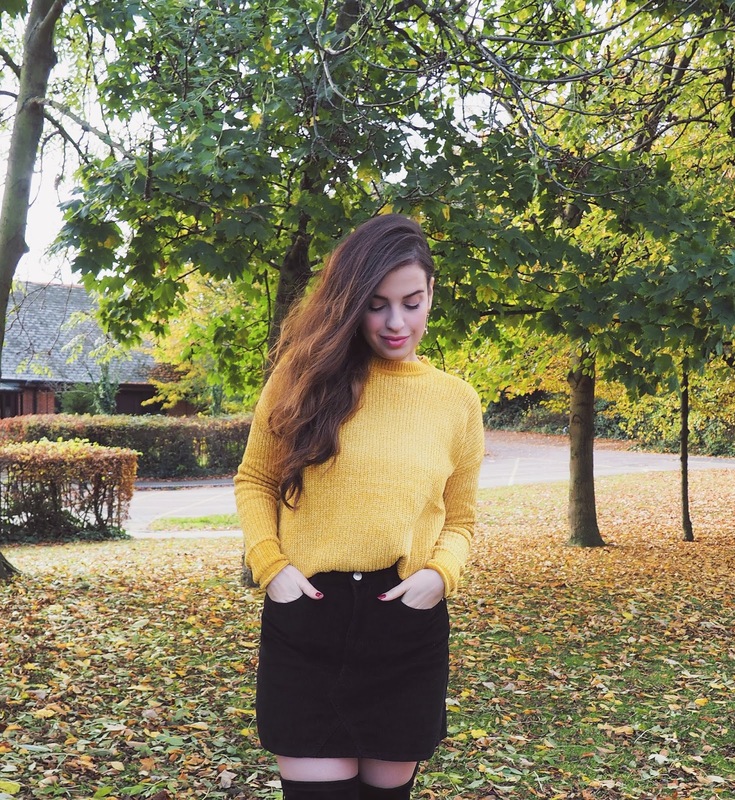 I am totally in love with that mustard colour for Autumn! It compliments you really well. thank you! I wasnt too sure about the colour on my skin tone at first but I LOVE it! Yellow and black combination is one of my favorites.. You look fab.. Awesome styling.. You look great..Wonderful post dear! I can definitely see myself wearing this on repeat! Thanks lovely! i'm lovvvving mustard lately, and glad to see that you are, too! LOVE this outfit on you, Pam! You look amazing! This outfit is gorgeous. I'm surprised the jumper is from Primark. I'm actually heading there this week or the next to see what I can get in terms of winter and work wear. 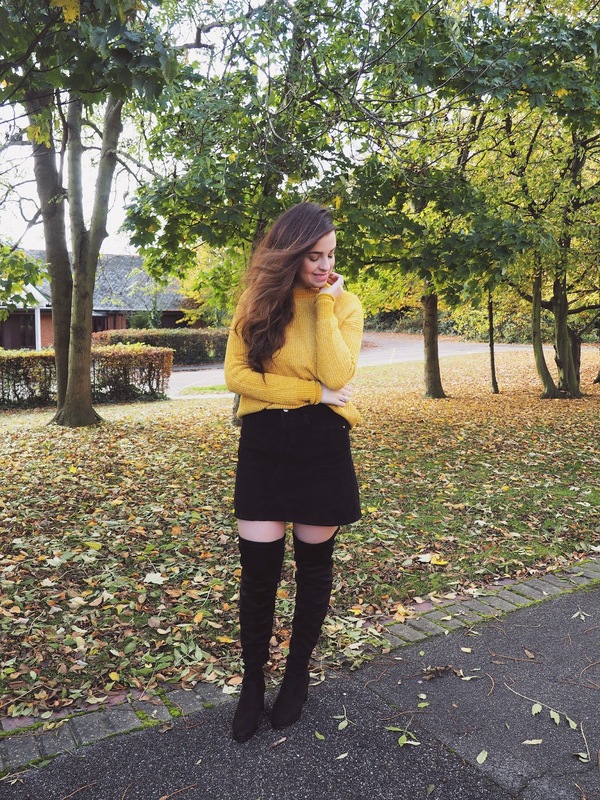 I love autumn and winter with a pop of colour, and I also love Primark! 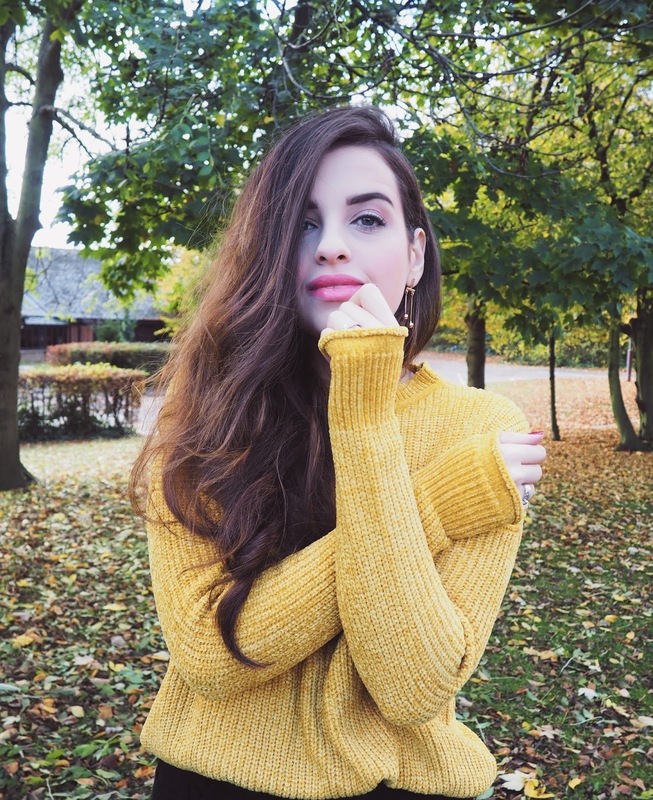 And to add more love :) I also am crazy about chenille and mustard - your jumper is really so beautiful and you look amazing! The otk boots are the perfect complement to this lovely outfit! Gorgeous! Hope you have a sweet week! Que linda, Pam! 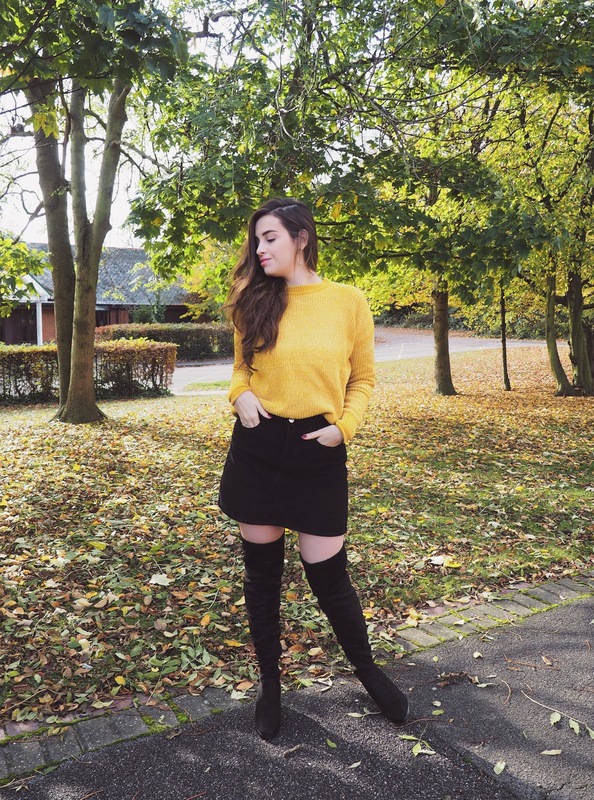 <3 A minha cor favorita para roupa de Outono/Inverno é, sem dúvida, esse amarelo mostarda. É lindo lindo! Fica maravilhoso com o preto, e com jeans azuis escuros! You look so cute! this color suits you really well! I am loving you in yellow! What a gorgeous color on you! I love it paired with the black in the skirt and boots! Such a gorgeous fall combo! I saw this outfit on your IG, Pam and you look absolutely stunning! Mustard is not a flattering shade on me unfortunately. I fell in love when I saw this on IG. You look fabulous in this style. This is easily one of the cutest color I've seen for a sweater dear. Look perfect with your skir and over-the-knee boots. And btw, your hair is really gorgeous! This is a beautiful mustard jumper, the colour suits you beautifully. Really do like the way you have teamed the jumper with your skirt and boots, gorgeous! I just love this color!!! It is quite vibrant and classy. I am obsessed with colors and unique designs. Recently, I have collected some amazing casual dresses for women which have great designs along with classy colors. In short, it's a steal. Love the yellow mustard on you. I need to add some more knits into my wardrobe, I feel like I live in the same two at the moment. ohhh you are looking so pretty in that fall ensemble!! 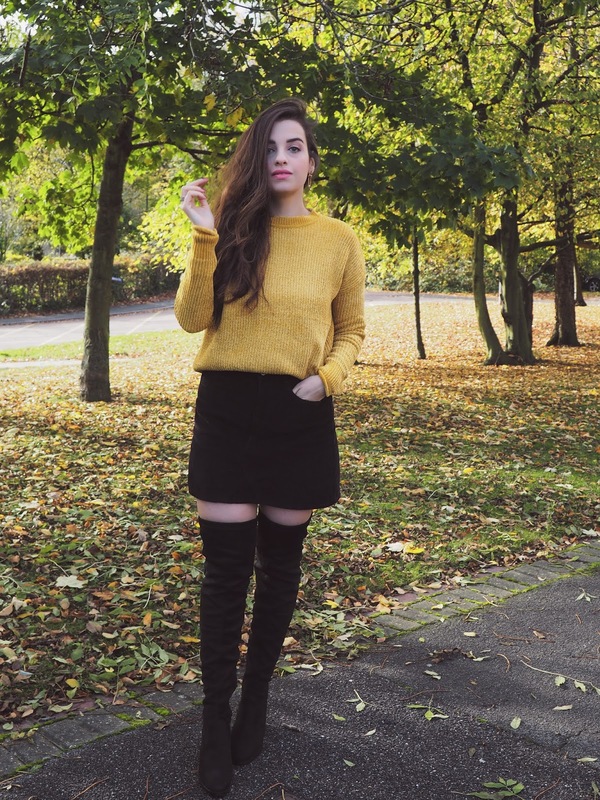 I love mustard for Autumn and you styled it so well. Another must have colour for me is burgundy, obsessed with it at the moment.